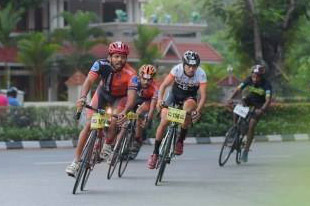 Trivandrum, 9 April 2017: L Sreenath emerged as the winner in the Champion ride in the second edition of mass cycling event, SilkAir Trivandrum Cyclathon 2017. Renjith C finished second and Anoop Kutty came third. The Cyclathon organized by Stark Communications in collaboration with Indus Cycling Embassy and the Trivandrum Bikers' Club included 178 participants in the Champion ride, Fitness Ride and Stark Kids Fun Ride categories. The event was held at Manaveeyam Road-Vellayambalam-Kowdiar-Pattom-PMG-LMS-Vellayambalam circuit. The event was organised to promote cycling as a fun and healthy activity to keep fit and ward off modern day health problems. The 'SilkAir Trivandrum Cyclathon 2017 intends to create public awareness about the importance of having a healthy lifestyle and aims to promote cycling as one of the best ways to reduce the risks of various lifestyle diseases that plague us today.